The Jewish community of Roma is one of the oldest in Europe and one of the oldest continuous Jewish settlement in the world. Jews were in Roma in the second century B.C.E. and their number increased in the following centuries because of immigration and because of transportations of prisoners of war and slaves during the Roman-Jewish wars in Judea and in Palestine (from 63 B.C.E. to 135 A.C.). In 70 A.C. Titus destroyed the Temple of Jerusalem. 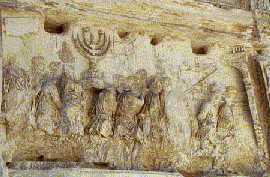 He brought many Jews to Rome as slaves, as well as the Menorah stolen from the Temple. The Jews living in Rome paid a ransom to liberate their brothers. During those times there were tens of synagogues in town. The condition of the Jews in Roma deteriorated with the diffusion of Christianity, during Middle Ages and first Renaissance the condition of the Jews of Roma changed following the politics of the Pope. After the fourth Lateran Council (1215) copies of the Talmud were burned and Jews were forced to wear a distinctive badge (a red tabard fo the males and a red petticoat for the women). In 1555 Pope Paul IV decreed that all Jews must be segregated into their own quarters (ghetto), and that they were allowed to leave the Ghetto only during the daytime. Jews were banned from most occupations, and the only two professions permitted were money lending and selling used clothing. . In the Ghetto there were five Synagogues: Scola Catalana, Scola Castigliana, Scola Siciliana, Scola Tempio and Scola Nova for about 5,000 Jews. During racial persecutions (1943-44) more then two thousands Jews of Roma perished the extermination camps. - Annie Sacerdoti, Guida al'Italia Ebraica, Marietti, Genova: 1986, English transl. by Richard F. De Lossa, Guide to Jewish Italy, Israelowitz Publishing, Brooklyn NY: 1989. - Sam Wagenaar, Il Ghetto sul Tevere, Mondadori, Milano 1972. - Harry, J. Leon, The Jews of ancient Rome, The Jewish Publication Society of America, Philadelphia 1960. - Umberto Fortis, Jews and synagogues: Venice, Florence, Rome, Leghorn; a practical guide, Edizioni Storti, Venezia 1973. - Attilio Milano, Il Ghetto di Roma, Carocci, Roma 1988. - Cecil Roth, The History of the Jews of Italy, The Jewish Publication Society of America, Philadelphia 1946.